LITTLE ROCK (Aug. 16, 2018) — University of Arkansas System President Dr. Donald R. Bobbitt today announced the appointment of Edward Serna, Ed.D., as interim chancellor at the University of Arkansas – Fort Smith (UAFS). nnounced he is leaving the institution Aug. 31 after leading the campus for more than 12 years to become the executive director and CEO of the South Dakota Higher Education Board of Regents. Serna is currently chief of staff and vice chancellor for strategic initiatives at UAFS. Bobbitt said the UA System will work closely with UAFS to immediately begin a national search for Beran’s replacement, and that he will visit the institution in the coming weeks to meet with various groups on campus and in the community to seek guidance and advice. Prior to joining UAFS, Serna spent 15 years as a management consultant and program manager for both commercial and government organizations. He forged a career as a program manager in unmanned aircraft systems through his work with Science & Engineering Services in Huntsville, Ala. He also previously spent seven years as a strategy and organization associate at Booz Allen Hamilton, where he served as a consultant for the U.S. Army and NASA. Serna began teaching as an adjunct instructor in 2007 and discovered a passion for higher education, and began pursuing his doctorate at the University of Alabama in 2012. He joined UAFS in 2015 after a year as an assistant professor of management at Athens State University. 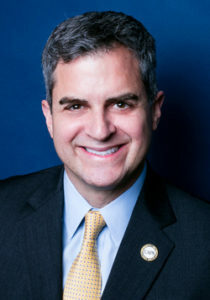 Serna earned his bachelor’s degree in business administration from Winthrop University, a master’s degree in industrial management from Clemson University and a master’s degree in information systems from Auburn University prior to his doctorate from the University of Alabama. He was also recognized as an Outstanding Doctoral Student from the University of Alabama’s Higher Education Administration program. He is a graduate of the 2017 class of Leadership Arkansas.